Cable subscribers are now in week five of the battle between Time Warner Cable and CBS that is keeping the network’s programming from being shown in such major markets as New York, Los Angeles and Dallas (On August 14, cable customers in Los Angeles filed suit against Time Warner for dropping CBS). These battles are not new. During the 2010 World Series, the Fox broadcast network refused to allow Cablevision to carry the network during the first two games of the World Series. In both cases, the core dispute was over the same thing: retransmission fees. Retransmission fees include cash or other compensation that cable, satellite and telecommunications companies pay to local TV stations and, indirectly, to the networks (such as CBS, NBC, ABC, Fox and CW) for the right to carry broadcast programming in the local markets. These fees are split between the local station and affiliated network, and are the subject of negotiations. Indeed, one of the reasons given for the recent sales of multiple stations to the Tribune and Gannett companies is it increases their leverage with networks when bargaining over retransmission fees. As the networks have negotiated for higher retransmission fees in the past decade, they have become an increasingly important source of revenue at a time when the advertising environment—except for political advertising—has grown more challenging. The growth in retransmission fee revenues helps explain the stakes in this high-profile Time Warner-CBS standoff. Retransmission payments have been increasing rapidly in the past decade, according to data from the investment firm Veronis Suhler Stevenson. 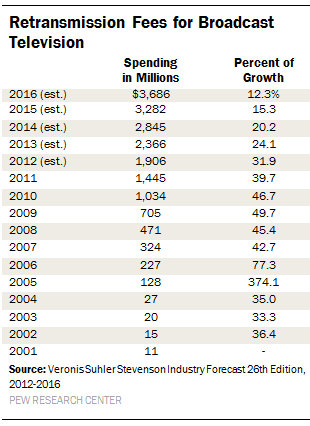 In 2011, the last year for which there were finalized data, retransmission revenues equaled almost $1.5 billion, more than 70 times higher than they had been in 2003 ($20 million). And estimates by VSS project that revenue will more than double—to about $3.7 billion—by 2016. 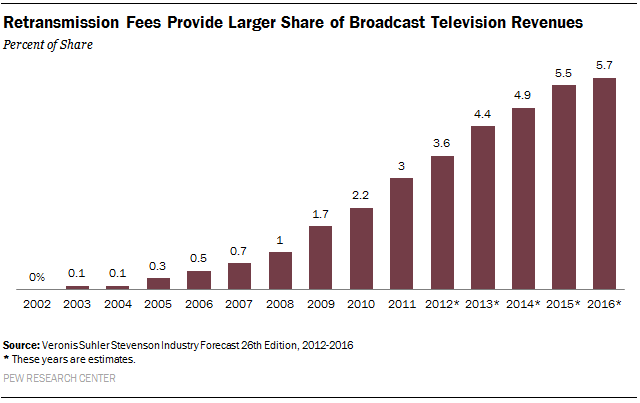 VSS estimates that, by 2016, the share of these fees as a percentage of overall station revenue will have doubled compared to 2011. Another financial information firm, SNL Kagan has an even more bullish projection, estimating that by 2018, retransmission revenue will account for more than 20% of TV stations’ ad revenues. A number of analysts have speculated that the Time Warner dispute with CBS may not be resolved until the National Football League kicks off play in September. (The first games on CBS are scheduled for Sunday, Sept. 8).